(CNN) -- New IBO light-welterweight world champion, Manny Pacquiao, is planning a career in politics, the 30-year-old told CNN on his return to his native Phillipines. 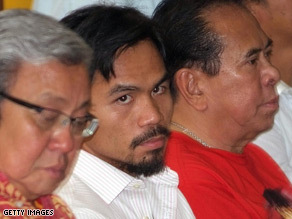 Philippine boxing champ Manny Pacquiao sits with Secretary of Environment and Natural Resources Lito Atienza (L) and former governor Chavit Singson (R) in Manila. Though "Pacman" will concentrate on boxing until next year, the man dubbed the best pound-for-pound fighter in the world suggested he could retire the following year to run for congress. "I want to be a Congressman so I can help the people," Pacquiao told CNN's Andrew Stevens. But when asked if becoming the Filipino president was his ultimate aim he added: "I wouldn't think about that because my ambition is only to run for congress. Pacquiao previously ran in the 2007 congressional elections for President Arroyo's party but was beaten by the Nationalist People's Coalition candidate Darlene Antonino-Custodio, who received 139,061 votes to Pacquiao's 75,908, Britain's Daily Telegraph said. Pacquiao is a national hero in the Phillipines but has seen his popularity grow around the world since his comprehensive victory over British fighter Ricky Hatton in Las Vegas. "I'm happy to be back (in Manila) because there's a lot of people supporting me here. I expected it in the Phillipines but I had many supporting me in America too." The man dubbed the "National Fist" will be a busy man over the next few months as he plans to make his second film and record a TV programme. This is a long way from his humble origins growing up in General Santos City, southern Philippines, a reality that Pacquiao says he struggles to believe sometimes. "I never dreamed I would reach the levels of success I have reached, he said. "But I have faith in God and discipline in myself to make the sacrifices (needed) and to train hard." In 14 years as a professional, Pacquiao has won world titles in four weight divisions -- from 7st 8lb to 9st 9lb, at flyweight, super bantamweight, super featherweight and lightweight. In his last contest, in December, in what many felt would be a step too far, he dismantled America's most popular boxer, Oscar De La Hoya, at the 10st 7lb limit, in eight one-sided rounds. Pacquiao is currently rated by The Ring, the sport's most respected trade magazine, as the best boxer in the world. His career earnings stand at an estimated £30 million, with major paydays coming relatively late in his career. However he remains modest despite the success. "It's a big honour to me and my family to be looked up to by so many people. "My inspiration comes from my family -- the people who are always there behind me supporting me and love me."